The city is distinguished by the Mediterranean Climate with an average temperature thatranges from around 16c in January to 30c in August. You would better bring both your sunglasses and umbrella with you since December and January are the wettest months, while July is the driest one. The city has been inhibited since the second millennium BCE.however,the modern city was first founded in the fourth Century. Subsequently ruled by the Romans, then the Ummayads, and Abbasids in the eighthtenth Centuries CE. Following WWI, Lattakia was assigned to the French mandate of Syria. Over centuries of attacks by both natural and human forces,all but a few buildings have been destroyed; those remaining include a Roman triumphal and Corinthian columns. For nearly four centuries, Syria was part of the Ottoman Empire. Along with what is now Lebanon, Syria came under French control afterthe Ottoman Empire collapsed in 1918, and became an independent country in 1946. Although Tishreen University (TU) is a relatively new and public academic institution, it leads the most influential and powerful higher education in Syria’s coastal region. TU opened its doors to all local students as well as to Arab and foreign students indiscriminatively back in the 1970s when it was established by the Ministry of Higher Education under the name of ‘University of Latakia’. Flash forward to 2017, it is the third largest university in the republic accommodating over 70,000 students in 21 faculties and three higher institutes. With the help of its advanced infrastructure, the university is devoted to promoting scientific methodology and freedom of thought, as it prioritizes evidence-based knowledge. Essentially, Tishreen University relies on highly qualified personnel gathering a broad spectrum of professionals and specialists who are dedicated to the nourishment of the Syrian society and the advancement of science. During the 1980s, Tishreen University Hospital (TUH) was designed to be the largest hospital in the Middle East; it is now, after more than two decades of preparations, a modernized high-class health care institution, affiliated with the Faculty of Medicine at Tishreen University. Due to its off-campus location at thed southern entrance of the city, the hospital is effectively capable of hosting patients from Latakia and other provinces. TUH’s staff indubitably guarantees the best available health care service. Ensuring best-quality health care service to all patients from different origins, nations, races …etc. Accommodating medical and nursing students from many universities, primarily Tishreen University and Al-Andalus Private University, to qualify these students with the most needed clinical skills. With a myriad of residency programs, the hospital is prepared to recruit recently graduated doctors and nurses giving them the opportunity to acquire the best knowledge and expertise available. Syria's busiest airport is the Damascus International Airport. There are internal flights to Qamishli, and Lattakia, costing approximately 10000 SP one way. The airport is relatively well-equipped with most standard services. There are also buses departing to and from Baramkeh bus station in the centre of town (airport buses are the only ones which serve this bus station now - all other services have moved to the new out of town Soumaria bus station). After you arrive to Damascus city, you can use a taxi to take you to the Pullmans' station in Al-Adawi street. After you arrive there, you can reserve a ticket and directly get on the Pullman. The trip from Damascus to Lattakia takes around 5-7 hours. We will be waiting for you at the station in Lattakia. A very good idea is to go on foot especially for sightseeing. You can walk in Lattakia's nicest neighborhoods like Al American and Al Awqaf. Also you can enjoy a late evening walk at the Cornishe street. Micro buses, also known as servees, are one of the main sources of transportation in Lattakia. The main serves route is Dairi-Shimali. All journeys inside the city costs 40 Syrian Pounds. You can go from one place to another in Lattakia with at most one or two journeys. The route is written (in Arabic only) on the roof sign. Micro buses do not generally have fixed stops except at very busy points. There are also many city buses that likewise cost 50 SYP. Taxis are plentiful in Lattakia, making them a great mode of transportation. Taxis with the Lattakia Governorate logo on the side and a number on the roof sign are normally equipped with a meter, and it is best to use only these when hailing a taxi on the street. Lattakia is the go-to-place to have an exceptional summer vacation. People from all over Syria, as well as the Arab world, come to enjoy the fascinating variety of beaches and resorts. Lattakia has beautiful sand beaches, where you can sunbath or play a beach volleyball game. It also has some rocky beaches where you can dive and explore the stunning marine life. A great example is Al Abhath beach, which is a Marine wild life reserve. In Lattakia, you can spend a day camping and swimming at Wadi-Qandeel. In addition, you can spend a day at Mountain Breeze resort, a classy mountain resort with an infinity pool where you can swim and enjoy a stunning mountain view. Finally, you can visit many top-tier resorts like Rotana Afamia and Cote D'azure. These resorts have beautiful sand beaches. You can spend the day swimming, jet skiing or taking some exciting boat tours. In sum, you'll have an unforgettable swimming experience at Lattakia. Syrian cuisine is a mix of Arab, Turkish, and Mediterranean influences, and enjoys a worldwide reputation for its richness and variety as well as its Mediterranean health factor. Some of the world famous Syrian dishes include Falafel, Humous, Mloukhieh, Yalanji, and Sayadieh. You can enjoy a delicious Falafel and Humous breakfast at many restaurants around TUH. In addition, you can enjoy a tasty lunch or a late dinner at one of our sea overlooking restaurants like The View, Manuella and Jaghnoun. These restaurants serve both Syrian and international cuisines. Alternatively, you can enjoy one of our delicious pizzerias like Kabbas or Napoli. You will definitely enjoy the eating experience at Lattakia. In this overwhelming era, we are being overly pensive about life, future, career, specialty, and even personal and psychological issues. The more time we spend trying to organize the chaos in our minds, the more we get stuck in the endless circle of overthinking. At that time, all a person might need is a couple of days off enjoying hiking and camping activities in the charming nature of Lattakia. HIKING. Lattakia’s region offers a wide variety of hiking opportunities, from sea shores and sharp valleys to moderately high mountains. Whether you are looking for an easy hike in which you can chat, play games, and entertain, or you are searching for outstanding views that will take your breaths, there will be a trail nearby waiting for you. CAMPING. Either on a distinctive shore that joins a mountain and an estuary with a sandy seaside (Wadi Wandeel), or in a vivid forest (Qadmous), you will get the chance to experience unforgettable camping with your colleagues or friends. This is a great chance to escape the city’s loudness that absorbs you 24/7 into a relieving night in a warm tent lilting or chit-chatting. Lattakia’s nightlife scene is charming and diverse, which incorporates elements from both eastern and western cultures. You can spend a magnificent night at a Syrian traditional restaturant listening to folklore music, while you enjoy a delicious meal of fish, local salads, and Arak, a world-famous local drink. Moreover, you can spend an unforgettable night partying at Wadi-Qandeel beach. A great experience that joins mind-blowing music beats with a midnight refreshing sea breeze, clear night sky, and moon light. In addition, you can enjoy a fancy evening by having a dinner or a shisha at the View or Manuela restaurants. Finally, you can enjoy a cosmopolitan nightlife experience by attending various bars and parties at Lattakia's fanciest neighborhood, Al American. It is located 30km east of Lattakia, on a ridge between two deep ravines and surrounded by forests. Following the example of Lattakia, it was occupied by various epmires. It has a great fortress with a 28m deep ditch which was cut into living rock. The entrance of the castle is through an entrance on the south side of the fortress. Also evident are the Byzantine citadel,the crusader tea house, and a crusader church. An Arabic influence was made by the addition of a mosque and a castle with courtyards and iwans. In 2006 the citadel was recognized as a World Heritage Site by UNESCO. This is definitely a must-see ancient masterpiece.More information. 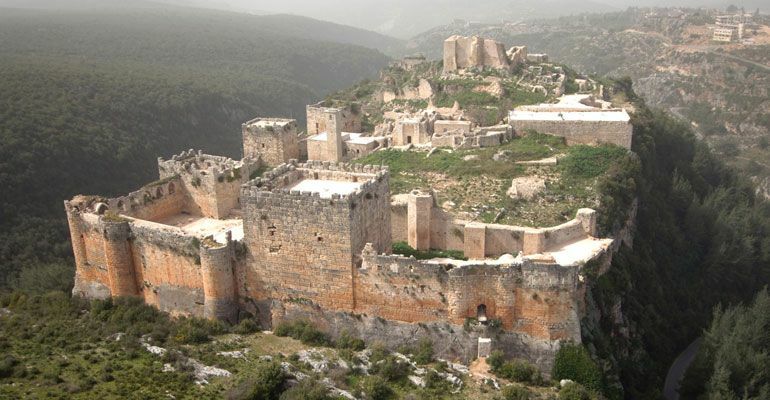 It was a Crusader fortress built 2km far from the Mediterranean Coast in a town near lattakia called Baniyas. In the Levant, the need for defence was paramount and this was reflected in castle design. Historian Hugh Kennedy suggests that "The castle scientifically designed as a fighting machine surely reached its apogee in great buildings like Marqab and Crac des Chevaliers". Marqab Castle is a large spur castle with many typical elements of concentric castle. It has a bent entrance leading through the base of a gate tower and a large outerward that gives it a larger total area. By visiting this castle, you will be lucky to take a tour around the village of al_Marqeb and being hosted by the generous village inhabitants. Outside the city, Wadi Qandeel is a marvelous beach. It is a sand beach surrounded by high mountains. People visit Wadi-Qandeel to relax and enjoy the beauty of the nature. You can enjoy a soothing camping experience, where you can spend the day swimming and playing beach volleyball, and the night enjoying a beer, bon fire, and a cozy star gazing experince. In addition, you can also attend one of its mind-blowing late-night parties.